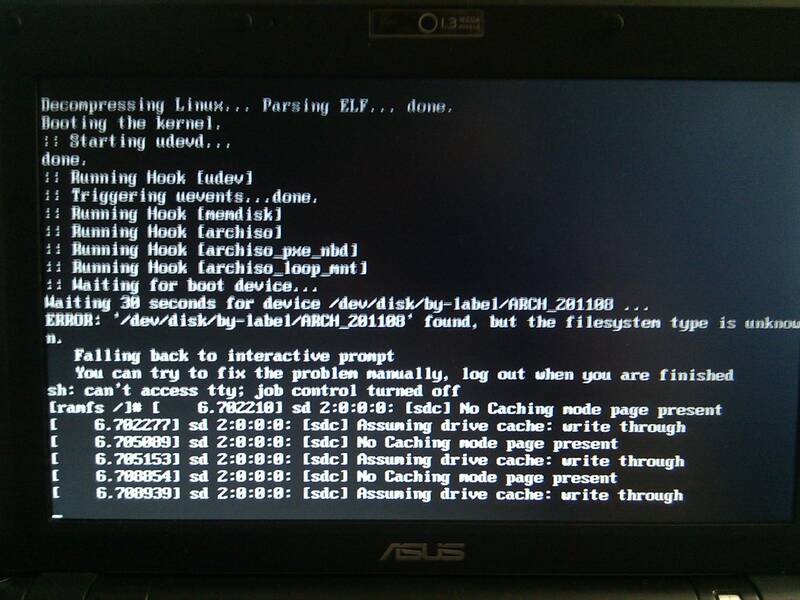 I'm trying to install Arch on a Asus eeePC 900. I installed the image on a usb memory with all the different methods mentioned in the wiki page. Everytime I try to boot into the installation it seems the memory can't be read anymore. doesn't seem to do anything and trying to mount it just says there's no fstab. so your trying to install arch from win xp? the thread you linked in your post talks about an image from 2009 is this the image your using or the new 2011 image? your unable to boot the image on usb or an install on the usb? Warning: Looks like you are reading old things. * Put a filesystem label (ARCH_201108) where "arch" directory reside. * Or change archisolabel= on syslinux.cfg to match your fslabel (where "arch" directory reside). I have been using the new image, ARCH_201108. I'm not installing from Windows XP, my netbook had Lubuntu on it, until I incorrectly dd´ed its / drive (/facepalm). So my netbook doesn't have an OS now, but what OS I had on it shouldn't really matter. I have another computer with Win7 and Ubuntu on where I have tried the unetbootin and dd and neither have worked, I get the error message mentioned above. Can you please fill in the details for the first and last options you mentioned? What am I supposed to place inside the arch directory? And what exactly are you talking about on the last one? What should I be booting? I am confused now, what you was doing. have you copied "arch" directory from .iso to some partition on your usb-storage? No, should I be trying this? I have only tried all the methods mentioned in the wiki. mmm I see now, what methods? Please point me. I tried the simple method and it didn't work. I partitioned my usb drive as ext3 with the Disk Utility ubuntu comes with, later did cat arch... and I got the same error. Am I overlooking something? I did the md5sum to check the iso and the drive and both came up clean. I don't get what the hell is going on. Why you partitioned the drive and make a filesystem on it, if you later overwrite this data? Anyway, the error says that device <ARCH_201108> is found but there is an unknow filesystem on it. Start again using any of two methods. Of course I tried it It didn't work tho. As I said, I tried every method on the wiki and none worked. With every single one I keep getting the same error message. I tried formatting the drive with ext2, ext3, ext4, fat16, fat32 with every combination and it still didn't work. EDIT: I just tried the usb key on another computer and it boots fine, so the problem is originating due to the specifics of my hardware. It's a Asus eeePC 900. Have you tried going into setup and making sure the usb is bootable? Also have you tried moving the usb stick between the different ports on the computer to see if one has a particular connection to being bootable? Try enabling options that slow down the boot process and give the system time to recognize drives connected to the USB as a boot medium. Also there is usually a shortcut for a quick boot selection menu that lets you choose a bootable medium. You can also check and see if you can specify the usb as the primary boot device, or take the hard drive out of the equation completely so the system waits for the usb-hd. Everyone keeps ignoring the obvious here: Two message regarding 'sdc' seem to keep repeating indefinitely. This leads me to believe that the USB drive doesn't initialize properly. What's even more confusing: It should wait 30 seconds, but returns after less than 7 seconds. Stupid idea: When it drops you to the prompt, unplug the USB, plug it back in, wait for a while, then logout and see what happens. I did as you said and unplugged it and plugged it in another port and kept getting the sdc text block.. No caching mode.. and Assuming drive cache.. Same thing happened if I tried the same usb port. Another idea: Boot with the kernel option 'loglevel=7' (Arch should have =4 by default) and do the same again. You should see more messages. I created my USB stick with Arch Linux (archlinux-2011.08.19-core-i686.iso) with unetbootin-linux-568. Which file did you edit? syslinux.cfg ? Just had the same issue after using unetbooting. I reinstalled arch on the usb drive using the dd command and it loaded fine. Welcome to Arch Linux. I am glad it is working for you. Please note that this is a very old thread. As such, I am going to go ahead and close it. If further discussion is needed, please feel free to start a new thread and, if appropriate, link back to this one.